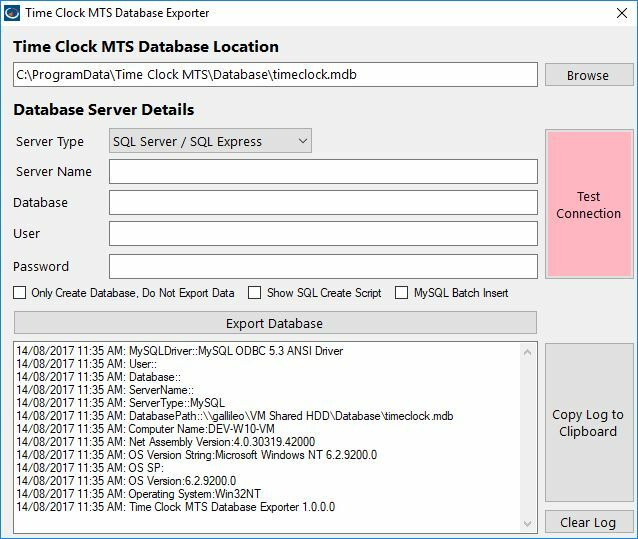 The Time Clock MTS Database Exporter is our tool to export your time clock data to SQL Server or MySQL so you can use the Time Clock MTS Network PLUS Edition with those more advanced database backends. 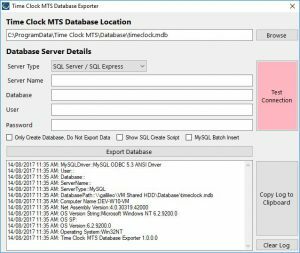 Instructions for exporting your time clock data to SQL Server can be found here. Instructions for exporting your data to MySQL can be found here. The Database Exporter is included when you install the Stand-Alone Edition or the Administrator version of Time Clock MTS. A separate installer can also be downloaded using the link below. Note that the Database Exporter WILL ONLY WORK ON A COMPUTER THAT ALREADY HAS TIME CLOCK MTS Version 6 installed on it. -Fixed data insert error introduced in last version. -Fixed problem with text fields that included the rn return characters. -MySQL Batch Insert method now uses string builder class. -Added "Ignore Primary Keys" checkbox to UI. When ticked tables are no longer checked to see if a primary key exists or not. -No longer include IDENTITY INSERT for tables that do not have a primary key. -Tool now handles the CURRENCY datatype from Access. -Modify sqlserver.cs and mysql.cs to export DateTime fields using ISO8601 format (YYYY-MM-DDTHH:MM:SS). ANSI format (YYYY-MM-DD HH:MM:SS) is supposed to work fine but failed in a Spanish regional installation of SQL Server 2014. -Fix to createSQLServerIndexes due to case sensitivity of some SQL Server installations. -Changed createTableData for sqlserver and mysql to use StringBuilder instead of catting strings. Huge performance increase for large data file exports. -Modify sqlserver.cs to handle numeric fields with null or empty values. -Modify mysql.cs to handle numeric fields with null or empty values. -Executable and installer are now digitally signed.